The owner of now-defunct ROM sites LoveROMS.com and LoveRETRO.co is working on a settlement with Nintendo. The gaming giant filed a copyright lawsuit last month accusing the sites of massive copyright infringement. This led to the shutdown of the sites in question as well as several other ROMs sites, who feared they could be next. Last month, Nintendo made it totally clear that websites offering access to its retro-games and ROMs will not be tolerated. Faced with millions of dollars in potential damages, the owner of the sites, Jacob Mathias, swiftly took the platforms offline. While the claims still stand, a new court filing shows that both Mathias and Nintendo are open to resolving the matter without a drawn-out fight. This week Mathias’ attorney asked the court to extend the standard period to respond to the complaint by three weeks, to enable both parties to continue ongoing settlement negotiations. Nintendo requested a substantial number of documents as part of the settlement negotiations. The defense provided these and, with the extra time, they hope to get closer to a settlement. If the case is not settled within the additional three-week period, no further extension will be requested. 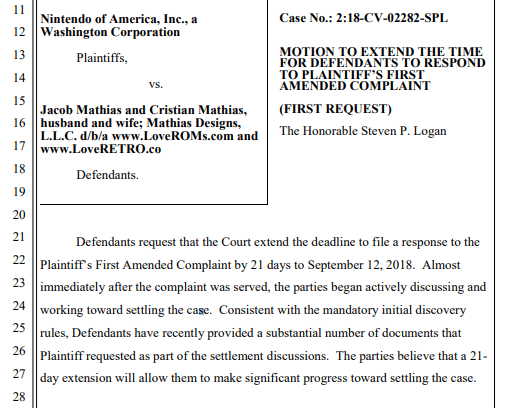 The filing suggests that this case may be over before it gets properly underway, which might be the best option for the site owner and his wife, who Nintendo previously added to the complaint. A lengthy, costly, and difficult to win court battle would then be avoided. Nintendo, for its part, wouldn’t mind saving on legal bills too. In addition, with a settlement, they avoid the risk of a ‘theoretical’ negative precedent where a court might rule that not all older ROMs are copyright-infringing. Most importantly, perhaps, is that filing the complaint alone has already had a sufficient deterrent effect. In the weeks after the lawsuit was made public, several ROMs sites ceased their activities voluntarily. Not because they were suddenly in agreement that offering retro-ROMs is wrong, but mostly because they wanted to avoid a legal battle that could end in bankruptcy. Nintendo’s actions and the subsequent fallout has left many retro-gamers without their preferred ROMs sources. However, it is unlikely that any type of legal action will completely root out their passion for good.